Samantha Powers defeated Alexandra Clay in the women's final. 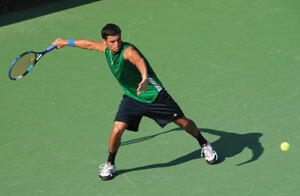 Eduardo Pavia of Puerto Rico won the 2010 US Open Men’s Southern Section Qualifying Tournament. The 21-year-old played solid baseline tennis in the final beating John McLean 6-1, 6-4. Samantha Powers won the US Open National Southern Sectional Qualifying Tournament in Atlanta Monday with a three-set victory over Alexandra Clay. "I played very well today," Pavia said, "I am looking forward to the national qualifier." The 21-year-old was the 2010 MAC Player of the Year, compiling a 18-4 record at Ball State University in Indiana. Pavia and two other members of the Puerto Rican Davis Cup team – Alex Llompart and Joes Sierra-Short -- came to Atlanta to prepare for their upcoming Davis Cup matches against Honduras, Costa Rica, The Bahamas, Cuba and Bermuda. "We came here to the tournament to get away from home and away from any distractions," explained Pavia. "We knew this would be a tough tournament." Pavia cruised through the first set with a solid ground game. The second set was tight until 4-4, when the champion raised his play to take the last two games. Pavia will now move on the national qualifier also here in Atlanta, which will be held at the Atlanta Athletic Club July 22-25. For Pavia, he is one step closer reaching his goal. "It is a dream to play in the US Open, and I have to play even better to win in the national qualifier, which will have even tougher players." For his opponent John McLean, this was a great opportunity to pick up his racquet once again. A former collegiate player for Southern University, McLean now is the assistant coach at North Carolina Central University. McLean has not played a tournament in two years but he proved that he still can play at a high level. "I am very happy, but obviously I wanted to win," McLean said, "I came here because my mom convinced me to, and I am very glad that I came back to Atlanta and played in this great tournament." He was accompanied by a large group of family members, all wearing "Team McLean" t-shirts and identifiers like "Big Sis" on the back. The 2010 US Open Southern Qualifier was a great success, thanks to all the players, officials, volunteers, and the Racquet Club of the South for all their hard work and support. Powers of Rome, Ga., won the first set, 6-3. Clay fought hard for a comeback in the second set, winning 6-3. However Powers took the win in the third set, 6-1 as Clay wilted. After the girls shook hands, USTA Southern Vice President Eddie Gonzalez made a memorable comment at the trophy presentation. "I want you both to know you both made history today." This is the first year of the US Open National Playoffs. Powers said, "It’s really awesome to be the first." She has been playing tennis for 11 years and is nowhere near the end of her career. Her motivation for entering this tournament she says "was just to have a chance to play in the US Open". She finished off saying, "Hopefully I’ll do well at Stanford." Powers advances to the US Open National Playoffs – Women’s Championship, July 29-August 1, during the Bank of the West Classic at the Taube Family Tennis Stadium at Stanford University in Stanford, Calif.
Clay, of Grayson, Ga., has been playing tennis since she was 8 years old, and started playing tournaments when she was 12. She is done with juniors now and her next step will be playing for the University of Alabama, where she has a full scholarship. Although she lost to Powers in the final round, she was glad to have the opportunity to play against people she had not played before. "I hadn’t played a tournament in a while," she explained. "It was just for fun and to see what happened." John McLean, the assistant tennis coach at North Carolina Central University, and Eduardo Pavia of Puerto Rico will play in the men’s final Tuesday at 9 a.m.
McLean defeated Nathan Rakitt 6-4, 7-6(3). 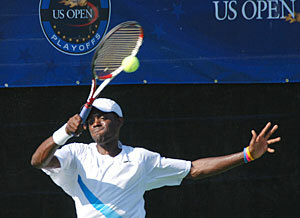 Pavia, a member of the Puerto Rican Davis Cup team, downed Austin Smith 6-4, 6-1. It was a good morning for Racquet Club of the South, the host faciluty. Nathan Rakitt, who trains at RCS, defeated Jose Perdomo of Puerto Rico in the quarterfinal round with a score of 6-3, 7-5. Austin Smith, also a player from RCS, had a tough match against Dennis Myers of Charlotte, N.C. Myers, a tennis pro at Charlotte Tennis Academy, put up a tough fight in the first set, winning 7-5. However, he could not keep up with 16-year-old Smith, who won the second two sets 6-4, 6-3. John McLean, who is the assistant tennis coach at North Carolina Central University, defeated John Lawrence, of Roswell, Ga, in his quarterfinal match. McLean easily took the first set, 6-1. Lawrence did his best to come back in the second set, but came up short, giving McLean the victory, 7-5. Eduardo Pavia of Puerto Rico caught a lucky break in his Quarterfinal round when Pratik Shrivastava defaulted due to a shoulder injury. Two Georgia women will face off in the US Open National Southern Sectional Qualifying Tournament in Atlanta Monday. Samantha Powers, of Rome, will face Alexandra Clay on the Racquet Club of the South Stadium Court, scheduled for about 11 a.m. Powers, has played four matches on USTA Pro Circuit and ITF pro tournaments this year, defeating Britain's Jennifer Allan in Saint-Martin 2-6, 6-2, 7-6(2). Clay, long a standout in USTA Southern junior tournaments who hails from Grayson, is headed to play at the University of Alabama as a freshman. The men's quarterfinals will begin action tomorrow at 8 a.m. and semifinals will be played later in the day. Players left in the draw are: Austin Smith, Dennis Myers, Pratik Shrivastava, Eduardo Pavia, Nathan Rakitt, Jose Perdomo, John Lawrence and John McLean. The men's final will be Tuesday at 9 a.m.
Clay, who will play tennis as a freshman at the University of Alabama this fall, blasted her way past Peterson 6-0, 6-1 in the second round. Clay is from Grayson, Ga.
Peterson, of College Park, Ga., dedicated her play to her late father, Ernie, who passed away in April. Ernie headed up the Peterson School of Tennis and was an influential force in Atlanta's junior tennis. For a complete story on Jewel, click here. USTA Southern staffers in the playoffs were led by USTA Southern Executive Vice President Mike McNulty. Read more by clicking here. 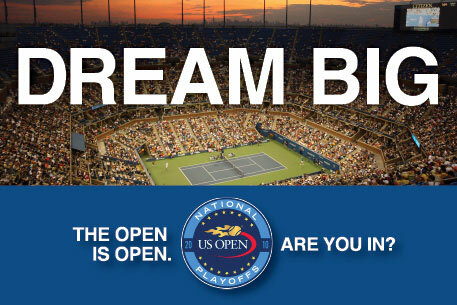 If you’re going to dream, dream big ... as big as the US Open. That’s the goal for 100 tennis players who will face off in the US Open National Southern Sectional Qualifying Tournament in Atlanta June 12-15. Their goal: Win two tournaments against players from around the country to advance as a wild card into the US Open Qualifying Tournament. Win that and you’re in the first round of the US Open in Flushing Meadow, N.Y. at the Billie Jean King National Tennis Center! The tournament to be played June 12-16. The tournament, run by USTA Southern, will be played at the Racquet Club of the South, in Norcross, Ga. Notable college, junior and senior players have signed up to play. But, also included a number of less accomplished players have also decided to give it a shot, even if they haven’t made a dent in any regional or national tournaments. Men winning the 16 section tournaments will play for the slot in the US Open National Playoffs -- Men's Championship during the Atlanta Tennis Championships at the Atlanta Athletic Club in Johns Creek, Ga. July 22-25. The US Open National Playoffs is a series of tournaments around the country that gives all players, over the age of fourteen, the chance to play their way into the 2010 US Open. Junior, college, and adult players have all signed up to help make this tournament a success. There is no shortage of talent here. The US Open National Qualifier is arguably one of the most unique tournaments in the country. The ability to play into the US Open entices players of all ages. Christian Garay, ranked No. 3 in USTA Southern last year, is the youngest of the participants. Garay, born in 1996 is looking to surprise some of his older competitors this weekend. On the other hand, Pinion Clarence, 64 and the oldest player in the draw, is a 2.5 player that is not afraid of competing with players half his age. Kevin Fleck, of Statesville, N.C., a former top ranked junior and player for Clemson University, has signed up to play. Eduardo Pavia and Alex Llompart are two collegiate players looking for their chance to play in the US Open. Pavia, formerly ranked in the top 50 junior players in the country, currently plays for Ball State. Llompart also enjoyed much success on the junior circuit when he reached the number five ranking in the country. Llompart now plays for Pepperdine University. The Atlanta metro area is also well represented by several of its top junior players. Alexandra Clay of Grayson, who has signed a letter of intent with the University of Alabama, will try to make her mark on the women’s draw. Gabriel Townes, one of the top juniors in the state of Georgia and future Georgia State Panther also is competing in the tournament. Tour player: Jewel Peterson, Atlanta, played a Sony Ericsson World Tour tournament in 2005. Oldest player: Clarence Pinion, 65, Bossier City, La., is listed as a 2.5 NTRP player, considered a beginner in USTA League play. Youngest player: Christian Garay, 14, Columbus, Ga., is ranked No. 3 in the 14s USTA Southern in 2009. Media: Candy Reid, sports anchor of CNN International’s "World Sport." Longest distance: Three men are traveling from Puerto Rico. USTA Southern is well represented with a top-level volunteer and two staff members. Mike McNulty, Executive Vice President, is traveling from Louisiana to play. Executive Director John Callen has a much shorter commute as the section’s office is less than a mile from the site. They are looking for success despite their veteran status. Adult Rankings/IT Assistant Mikael Pettersson, a former Georgia College & State University player, is also competing. The US Open National Playoff gives all players a once in a lifetime chance to play in the 2010 US Open, and the Southern qualifier will give tennis fans a wonderful opportunity to watch some great tennis. The Taube Family Tennis Stadium at Stanford University in Stanford, Calif., will host the US Open National Playoffs – Women’s Championship, July 29-August 1, during the Bank of the West Classic. In January, USTA announced the launch of the US Open National Playoffs which will expand the footprint of the US Open and provide the opportunity for all players 14 years of age and older to earn a wild card into the 2010 US Open Qualifying Tournament. "We are thrilled to hold the US Open National Playoffs – Men’s and Women’s Championships in conjunction with the start of the 2010 Olympus US Open Series," said Jim Curley, Chief Professional Tournaments Officer & US Open Tournament Director. "We now have six months of tennis under the US Open umbrella. From April through June, weekend warriors, top amateurs and aspiring pros can compete in the US Open National Playoffs, which now culminates in July when the world’s top professional players come to North America for the summer hard court season in preparation for the US Open." "The US Open National Playoffs makes the US Open ‘open,’ where one woman and one man will earn a wild card into the US Open Qualifying Tournament and a chance to advance to the main draw," said Lucy Garvin, Chairman of the Board and President, USTA. "The fact that the US Open National Playoffs are supported by qualifying tournaments run by our sections makes this event even more unique, extending the reach of the US Open across the country." Registration for the Southern qualifying tournament for men and women will open on Monday, March 1 and runs through Monday, May 31. The draw will be conducted on June 7. USTA Southern Director of Junior Competition Sandy Hastings will serve as tournament director. USTA Southern Executive Director John Callen said, "We are elated that the USTA has opened up the opportunity for all tennis player to participate in our sport’s greatest spectacle." Racquet Club of the South Executive Director Steve Gareleck said, "We are excited to host the US Open National Playoffs for USTA Southern. We look forward to a successful and exciting tournament. We except a large number of top-rated players and are happy to have this opportunity to host this tournament." The entry fee for each of the sectional qualifying tournaments is $125. All players competing must have a current USTA membership valid through August 30, 2010. Competitors can enter any of the 16 sectional qualifying tournaments, but they can only enter and compete in one sectional qualifying tournament. Each sectional qualifying tournament is limited to 256 players, and players will not be seeded by any means. Participants can be of any playing level, from aspiring novice to seasoned professional, giving everyone an equal opportunity to advance. "While professionals are eligible to play, we expect the draws to be filled with top junior players, collegians, teaching professionals and even recreational players who will now have a chance to play themselves into the US Open for the first time," said Jim Curley, Chief Professional Tournaments Officer & US Open Tournament Director. "Tennis has always been a part of my life," said Miller, who won the 1996 Maine state singles title for Carrabassett Valley Academy and whose family owns the Tamarack Tennis Camp in Easton, N.H., which was founded by his grandparents. "The US Open National Playoffs are a great concept and I look forward to playing in one of the sectional qualifying tournaments this spring. It will give me an outlet to focus my competitiveness after the Olympics and World Cup season." Entry information and a schedule of US Open National Playoffs Sectional Qualifying Tournaments are available online at www.usopen.org.